Most VFX artists are independent contractors. President Obama at Dreamworks Nov 2013. The views and opinions expressed in this film are solely those of the filmmakers and do not represent and no way are affiliated with, sponsored, approved, or reflect the views of Rhythm & Hues, 34 X118 Holdings, Inc., Prana Animation Studios, or any of their respective affiliates or licensees. Spa Cover Pro manufactures the highest quality covers for your spa or hot tub. As an industry leader, we pride ourselves in providing top quality, durable covers for your spa. We manufacture the highest quality custom spa covers, hot tub covers and offer a selection of spa and hot tub accessories. When it comes to spa covers, our expert staff has over 45 years combined experience. And with our highly intense quality control program, we can ensure our custom spa covers and hot tub covers are meet the highest standards of quality. We build our spa covers use only the best materials available to ensure an outstanding finished product. We currently manufacture spa covers and hot tub covers for several leading spa and hot tub manufacturers and we’re offering the same quality products on-line to the public! Whether you’re buying one spa cover or a thousand spa covers. We are gearing up for the opening of our latest farmers market in San Marino next week! On March 7th the San Marino Farmers Market will launch with local vendors and farmers to create an incredible weekly event for the community. Come by and join us Fridays from 2pm – 7pm. The time has come for another epic battle…with chili. Vegan chili. Join us on Sunday, March 2nd to welcome the highly anticipated return of our Annual Vegan Chili Cook-Off. We’ve wrangled together an all-star cast of local chefs and judges to bring you one of our favorite events of the year. $10 gets your five 3-ounce tastes of glorious chili and one voting ballot for the Peoples’ Choice Award. Mark your calendars! This competition will be HOT! Follow us on Twitter & Instagram (at)tonysdartsaway! Sunday March 2nd is our Monthly Meet Up at Deezmaker. It’s time again for our monthly meeting of 3D printing enthusiasts. Want to see what this is all about? Come and drop in on Sunday, March 2nd anytime from noon to 5 PM at the Deezmaker 3-D printer shop at 290 N. Hill Ave in Pasadena. We have an open meeting on the first Sunday of every month. If you can’t make it this month, the next two will be on April 6th and June 4th. Have you been wondering what this 3-D printing excitement is all about? Spend an afternoon at Deezmaker Hackerspace in Pasadena, makers of the Bukobot and Bukito 3-D printer. You will learn how to download and use the relevant free open source software you need to use an Reprap (or similar) 3-D printer. 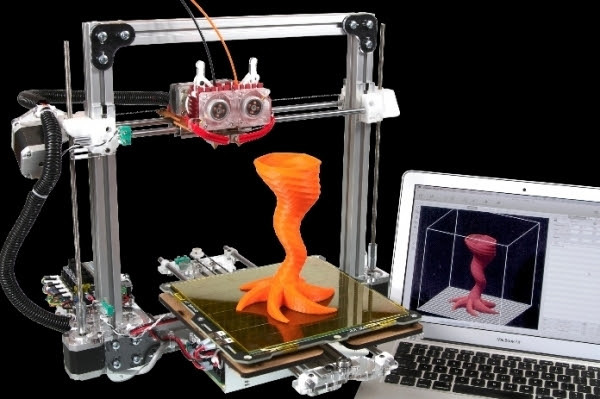 Open-source 3D printing requires use of two programs: a 3-D modeling program to lay out the desired model, and a program to convert that design into the commands for the printer (which runs on “G-code”). The class will be taught by Diego Porqueras, creator of the Bukobot and President of Deezmaker, and other Deezmaker staff. The class will cover a quick history of 3-D printing, types of 3-D printing and its relationship to the open source movement; basics of OpenSCAD and TinkerCAD free 3-D modeling software, and how “Slicing” works as a G-code generator. By the end, participants will make something cool in plastic with our 3-D printers! Each participant must bring their own laptop computer (Mac, Windows, Linux). Participants will be sent a list of open-source free software to download ahead of time to make the most efficient use of class time. The class will focus on the specific settings for a Bukobot, but the material applies broadly to all RepRap style open source based printers. Yoga studio designed for beginners, injured and the rest of us! We are a yoga studio that is designed for every body. We are approachable accessible affordable. We have classes for people dealing with various life situations, from cancer to diabetes, back pain to osteoporosis, inflexibility, stress and more! Classes are $10 and we have $5 senior and veteran class. Your first class is free. If you have never tried yoga, you can bring a friend! We are located behind Pizza Hut in the corner. I look forward to meeting you all soon! Southern Culture Artisan Foods, Inc. is a Decatur, Georgia based company that provides a lifestyle breakfast brand to consumers throughout the world. Since 2011, Southern Culture Artisan Foods, Inc. has consistently generated revenue of over half a million dollars. Foods, Inc. is a private company. For more information on Southern Culture Artisan Foods, Inc. The Pasadena Farmers’ Market which had previously been held on South Lake and later moved to the Playhouse District is now going to move to Pasadena City Hall Centennial Square. We received word today at the Pasadena Certified Farmers’ Market at Victory Park. Also, note that there are a few other vendors making an appearance at the Victory Farmer’s Market, including Karen with Mother Moo delicious Ice Cream and a new citrus. New Saturday s, 2nd and 4th, Mother Moos Creamery, of Sierra Madre. Ice creams and popsicles…yum, and we certainly cannot blame winter on the good flavors. Stop and meet Karen, one of our newest artisans. More details are forthcoming on the new market. For more details the markets available in Pasadena. Also keep in mind that there is a market on Sunday’s operated by Southland Farm’s which is not the same organization that runs the other markets in Pasadena. NBC Nightly News managing editor and anchor Brian Williams raps The Sugar Hill Gang’s classic “Rapper’s Delight” — and, yes, he brought two friends along. What Does it Mean for Altadena? followed by a brief discussion of local issues. This “movie night” — to be held at the Altadena Community Center from 7 to 9 pm — will include popcorn and other refreshments, and is the second in our ongoing water-education series that kicked off last September with the Devil is in the Details panel discussion by local water experts. Water infrastructure plays a critical role in protecting public health, promoting economic prosperity, and ensuring a good quality of life. Unfortunately, many of these complex systems are aging, neglected,and in need of national and local attention. Whether the challenges call for immediate action or require long-term planning, communities throughout the country — including Altadena — are facing big financial hurdles and the serious consequences of an aging water infrastructure. Liquid Assets provides an accessible and highly relevant overview of our nation’s water infrastructure, including the state of wastewater and stormwater systems, and a segment on Los Angeles. A short discussion after the film will further localize the concerns it raises and connect them to our situation in Altadena. Now that we’re facing a record drought, it’s critically important to educate ourselves so we can make the decisions needed to ensure safe and effective water systems for the future. Please RSVP by responding to this e-mail. We hope you can join us for this informative screening and discussion! Liquid Assets tells the story of essential infrastructure systems: water, wastewater, and stormwater. Out of sight, beneath our feet, these systems are in disrepair across the country. Fixing them may be the largest public works project in our history. Bring the family and join the fun! The Montrose Merchants invite you on February 23, 2014 Hours: Sunday 9:00 a.m. – 4:00 p.m.
O n Sunday, February 23, 2014 Montrose turns 101 years old! It was on Washington’s Birthday in 1913 that the subdivision of present day Montrose began. Developers Holmes and Walton auctioned off 300 acres of land at a catered barbecue at the approximate corner of what is today Verdugo Blvd. and Clifton Place near the site of the local Mobil Station. Celebrate with us as we bring you alfresco dining with specials from our local restaurants, live music, an expanded Kids’ Zone, retail booths in the 2200 block of Honolulu representing some of our Montrose merchants’ best offerings, and of course our Sunday Harvest Market and Marketplace in the 2300 block. At 2pm, gather around the stage on Ocean View to honor with us some of the folks in our community who have helped make Montrose what it is today. Following the Montrose Founders Day Awards Ceremony, we will sing “Happy 101st Birthday” to Montrose and serve free birthday cake to one and all! I’M A PRETTY LITTLE BLACK GIRL! introduces adorable Mia, who wakes with her hair “just-a-going every which-a-ways!” With her abundant energy and joy leading the way, readers follow Mia as she plays with her friends who are all shades, shapes and sizes. There’s tall Kia, Keisha the reader, Charlotte her best friend, Dina Rose-Marie the artist, Imani the dancer, Anna who loves sports, Ruby the singer, and honey-haired Tracy. Mia finds that “Pretty” is within herself and her friends, and being pretty is way beyond what the mirror shows. Panera Bread is coming to South Lake Pasadena. Corner Bakery Cafe located close by is always busy. Hundreds of Personal and Business Legal Forms, such as Power of Attorney, Wills, Leases, Living Trusts, Prenuptial Agreements and many more. Total Legal Care Plan: Our monthly and annual membership plans include unlimited Legal Document Access, unlimited E-Signature Services, unlimited File Safekeeper™ Document Storage, discounted Live Counsel™ instant legal advice service, and more. Pie Hole co-owner Sean Brennan is opening a location in Old Pasadena. Located in the same space as Cool Haus in the ‘Indiana Colony’. We hear that the offerings will include a pot pie and other savory and sweet items. Joining Google in 2001, Eric Schmidt has helped grow the company from a Silicon Valley startup to a global leader in technology. As executive chairman, he is responsible for the external matters of Google: building partnerships and broader business relationships, government outreach and technology thought leadership, as well as advising the CEO and senior leadership on business and policy issues. He served as Google CEO from 2001-2011. Prior to joining Google, Schmidt was the chairman and CEO of Novell and chief technology officer at Sun Microsystems, Inc. Previously, he served on the research staff at Xerox Palo Alto Research Center (PARC), Bell Laboratories and Zilog. In the next decade, five billion new people will come online, posing for our world a host of new opportunities—and concerns. Google’s Eric Schmidt and Jared Cohen traveled to thirty-five countries, including some of the world’s most volatile regions and met with political leaders, entrepreneurs, and activists to learn firsthand about the challenges they face. Eric Schmidt and Jared Cohen tackle some of the most interesting questions about our future as impacted by the dramatic increase in access to information and interconnectivity: how will technology change privacy and security, war and intervention, diplomacy, revolution and terrorism? How will technology improve our lives? What new disruptions can we expect? On the heels of months of news stories about online privacy and security, how can the U.S. government protect its national security without violating the privacy of its citizens? What is the balance between national security and individual privacy. In the age of Wikileaks and Edward Snowden, governments must find a way to balance their legitimate need for secrecy in security matters with demands for increased transparency and accountability from their citizens.